In front of you, ladies and gentlemen, stands the illusion of a photo, that is, the image before you is real. In front of you is not an illusion of reality fixed in time nor a simple constructed and composed photo, but reality seen through a hole in the wall, reality itself. Ladies and gentlemen, our reality is constructed through mirrors. That which you believe to be a photographic print on the wall is actually an illusion created by a series of mirrors. In front of you, then, stands a wall, that much is obvious. But did you recognize this supposed photographic print as a simple rectangular hole in the wall? Allow me to explain my little illusion. Behind this hole hangs the first mirror of the series. It is rotated by 45° such that your line of sight is turned 90° and travels behind the wall to the left. Still behind the wall, on your left-hand side as well, stands mirror number two. Mirror number two is also fixed at a 45° angle, thus reflecting your line of sight 90° back towards the third and final mirror. Mirror number three, just behind your left shoulder, like the rest, hangs at 45°  thereby reflecting the objects in front of it on to mirror number two, from mirror two to mirror number one and then through the hole in the wall directly back to you. 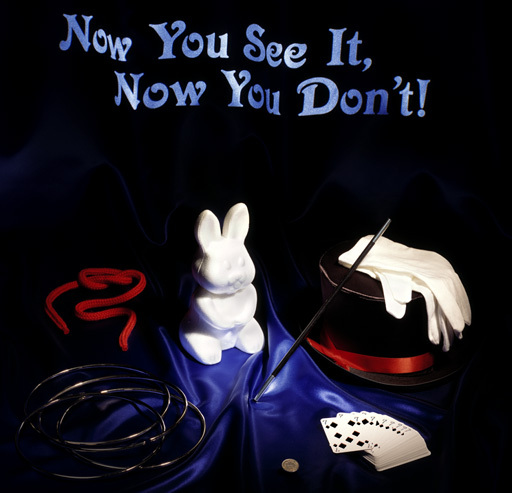 Abracadabra, ladies and gentlemen, and my explanation is complete  the objects you see before your eyes are actually located directly behind you.